This wonderful statement appears in a recent publication by Professors Schultz and Villinger at the University of Rostock in Germany. They discuss the preparation of mercury azides and the azide of something called Millon’s Base. 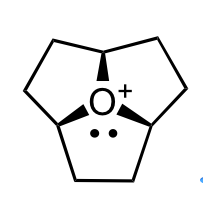 This compound was new to me and it turns out to be nitridodimercury hydroxide, [Hg2N]OH.2H2O, which Millon1 discovered by the reaction of mercurous oxide and ammonia in the mid 1800s. In a classic example of understatement the authors’ state that as is the case with most transition metal nitrogen compounds the extremely low energy barriers to explosive decomposition result in difficulties in the isolation and manipulation of said species! Curtius, of rearrangement fame, was apparently the first person to isolate mercury azide Hg2(N3)2 from the reaction of hydrogen azide and mercury2. I guess this was after the discovery of his famous rearrangement. Structural data for this compound is available from x-ray and revealed two modifications, called α and β. Due to its lability the β modification has not been fully characterised. Schultz etal have now rectified this situation and also report the preparation of the azide salt, [Hg2N]N3 of Millon’s base. They prepared α & β-Hg(N3)2, the latter compound by slow diffusion of aqueous sodium azide into a solution of mercury (II) nitrate separated by a layer of aqueous sodium nitrate. In this synthesis one wonders how any yield was obtained because when the needles of β-Hg(N3)2 begin to form in the lower mercury(II) nitrate layer spontaneous explosions occur during crystal growth. If you want large crystals of either modification, usually obtained by slow crystallisation, I would not recommend it as apparently large crystals seem to explode when you look at them the wrong way, even in solution they detonate. Explosive solutions would be a great name for a company! Anyway, in spite of these difficulties an X-ray structure along with a melting point was obtained. 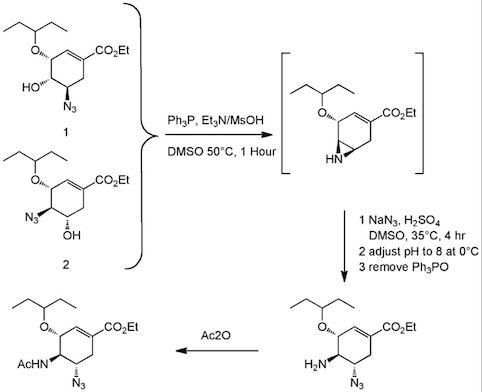 Turning now to the synthesis of the azide of Millon’s base the authors note that the normal method always produced a mixture of the two modifications. Pure α-[Hg2N]N3 was obtained by treatment of α-[Hg2N]Br with concentrated aqueous sodium azide for 300 days, so you need patience when dealing with these compounds, not only because they are explosive but they suffer from long reaction times. However starting with β-[Hg2N]NO3 the reaction was faster, only taking 4 days for the exchange with azide but produced a mixture of modifications. However, they did manage to obtain both modifications. Elemental analysis could not be carried out due to their explosive nature and both modifications are sensitive towards heat, shock and especially friction. The bigger the crystal the more sensitive it is. However, slow heating in a DSC instrument showed that they are stable up to 283°C for the β form and 313°C for the α. Rapid heating in a closed vessel caused violent heavy detonation accompanied by a bright blue flash. The paper has some fascinating x-ray pictures of all the molecules discussed and allowed determination of the N-Hg bond lengths. Together with the chemistry and the dangers involved in this chemistry, a great piece of work has evolved into a wonderful very readable paper. Congratulations to all who participated. 1 E. Millon, J. Prakt. Chem. 1839, 16, 58. Synthesising small molecular machines has been somewhat limited to making molecules that can walk or spin round cogwheels. Mind you that is still pretty impressive. Now things are set to change with a recent publication in Science by Dr Leigh from the University of Manchester in the UK. The Manchester group synthesised a rotaxane (a molecular ring) threaded through an axle that consists of peptides. The rotaxane has a thiolate moiety that removes the amino acids in sequence and transfers them to the site of the new growing peptide chain. There is a wonderful summary in C&E News, with an interesting video of how it all works. The group used 1018 machines in parallel to generate milligram quantities of a single sequence peptide. This mimics the ribosome in its valuable function in the generation of peptides. The “arm” picks up the amino acid by a transacylation reaction and delivers them to a different place on the ring. There are still some problems to be solved, for example the rather slow reaction rate as the ring needs about 12 hours to make the amide bonds. Compare this to the 15-20 bonds per second produced by the ribosome itself. There are a few other problems, and no doubt they are being addressed at this moment. However this paper and the technology are impressive and will probably have a great future. Imagine what several moles of these could do once things become optimised, producing peptides of any sequence one desired, natural or unnatural. This is a fascinating concept and I look forward to seeing lots more appearing on this system.